I believe that I never will forget the good old days that I spent at ‘la Casa del Joven Creador‘ (the House of the Young Creator) in the Avenida del Puerto [Havana, Cuba]. It was the preferred venue for many of my generation, at a beautiful stage of our lives. Regulars of that space keep alive vivid memories of the concerts and improvised performances put on by people who, today, are prominent figures in the contemporary panorama of Cuban songwriting. One of the artists from that time, who, with his guitar and voice, helped us to weave a complex fabric of utopian visions, and to feel that there was much more to life than mere existence, was Evaristo Machado, an artist frequently found playing chords and melodies on the patio of that big old house at the corner of San Pedro and Sol. A native of the City of Havana, Evaristo graduated from the Conservatorio Ignacio Cervantes, where he studied singing, classical guitar, piano, acting and the theoretical subjects that prepared him to be a composer. His public appearances as a musician began in the first part of the1980s, when he started to act and sing as a member of different groups in the Havana club scene. At the same time, his career developed as a singer/songwriter, in which he tried to bring together diverse musical themes, genres and styles, from rock to Salsa, and from pop to Nueva Trova. Despite being a formidable vocalist, it was not through his own voice that his first pieces became popular, but through cover versions, such as by Grupo Mezcla. Evaristo’s first professional appearance (a special date in 1987) was when he took to the stage as a guitarist with the group backing up the outstanding multi-instrumentalist Jesus Morales (‘Moralitos’). Another experience that had a profound effect on his career – a period which marked his formation as an artist – was when, in 1988, he became a member of the National Radio and Television Chorus, where he worked as a singer for the space of a year. Now ready for bigger challenges, in November of 1989 he auditioned as a vocalist for [Havana’s] Tropicana nightclub show. His daily work with the famous nightclub act gave him a training that remarkably widened his creative vision, giving him the ability to construct songs of a thoughtful nature, and that make us ponder and turn over in our minds the things that surround us. At the same time, he developed the secret art of composing music designed to get people dancing and burning energy. He stayed with the Tropicana show for six years, and appeared in such countries as Spain, France, Switzerland, Belgium and Holland. In 1997, he was asked by the Canadian Jane Bunnett to take part in a project integrating jazz with Afro-Cuban rhythms, in the company of other instrumentalists such as the pianist Hilario Durán and trumpeter Larry Kramer. That collaboration opened many doors for Evaristo by introducing him to the Canadian music market. This way, he was able to perform at the [then] Du Maurier Theatre with Memo Acevedo in 1998 and at the TLN Festival. A short time later found him singing in front of Pablo Terry’s band, Sol de Cuba, and other groups such as Klave y Kongo and Son Aché. All these experiences nourished him, and allowed him to form his own band, which, starting in 2000, performed in diverse events, such as the College Street Festival and other shows dedicated to jazz and Latin music. He also shared the stage with numerous figures performing in the city of Toronto, such as when he took part in a show with the Afro-Cuban All Stars, the famous big band headed by expert ‘Tres’ player Juan de Marcos. In the summer of 2004, Evaristo Machado released his first recording, entitled ‘Luna del Barrio’. In accordance with the things he has done over the years, this is an album that is framed within what the specialized critic defines as modern salsa, with a set of compositions in whose arrangements there is a strong presence of orchestrated elements coming from Latin and Afro-Cuban jazz. As a whole, the CD allows us to verify Evaristo’s potential as a singer, who stands out as much by his refinement as by his ability to improvise in the Cuban ‘montunos’ style. Although his objective is clearly to make us dance, once again I confirm that he also has the power to give us refined and subtle lyrics, that do not present any type of pretense but rather, when all is said and done, simply dignity and elegance. To give a taste of the tracks on the CD, I call special attention to the cuts ‘Salsa con Timba’, ‘Luna del Barrio’, ‘El Baile del Saoco’ and ‘Por la Carretera’, as well as ‘Desamparado’ (Abandoned), a very good song with certain ‘funky’ style. As a representative Salsa recording that also tries to explain things, I see this as a prelude to more diverse works that I believe are sure to come. 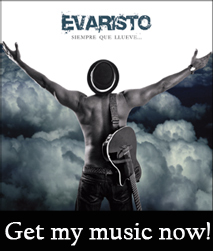 Translated from the Spanish for www.evaristomusic.com. Click here to read the original article in Spanish.